Please Visit These Links Below To Further Your Shopping Experience. Welcome to Rick's Appliance & Home Furnishings! Family owned in downtown Mora since 1985. We offer educated sales personnel, quality customer service before, during and after the sale, as well as a full array of household appliances, appliance parts, home furnishings and home decor to suit your needs. BRANDSOURCE is a national buying group, which allows Rick's Home Furnishings to remain competitive and offer the same or better value than many of our larger competitors. We also offer incentives such as rebates, easy financing and extended warranties that are often only associated with the larger box stores. BRANDSOURCE membership allows us to offer you the buying power of over 3,000 locally-owned stores with a combined annual sales volume of ELEVEN BILLION DOLLARS, that means you get the BEST VALUE each and every time you visit Rick's Appliance & Home Furnishings. Building, Remodeling, Replacement- Whether you are building a new home, remodeling your current home or just replacing one appliance our knowledgeable sales staff will work closely with you to make certain they understand your needs before making a recommendation for you, your home, your lifestyle and your budget. 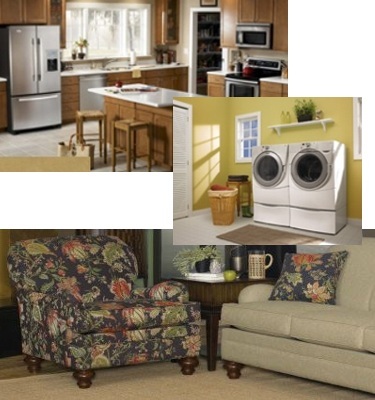 When you need service, Rick's Appliance & Home Furnishings is the only name you need to know! We offer prompt and professional service at competitive rates. Our Factory Trained service technicians are just a phone call away. Rick's Appliance & Home Furnishings.